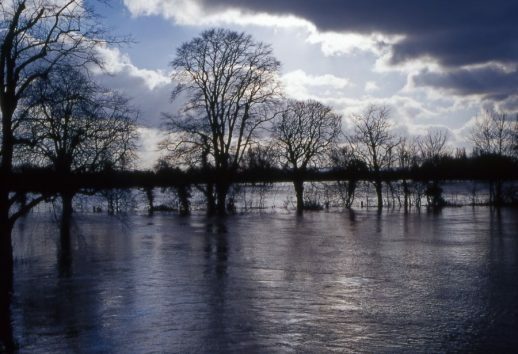 The river Thames flooding at Wallingford, Oxfordshire due to exception rainfall. June 2003. Dr Suzanne Martin, Research Liaison Officer with the Forestry Commission at Alice Holt has written to us with news of the recently published LWEC Report Card covering forestry. The card provides an accessible and authoritative summary of the latest scientific evidence about the impact and future risks/opportunities of climate change for forestry in the UK. It is aimed at anyone who works with, or has an interest in, agriculture, horticulture & forestry. It aims to improve understanding of the scale of possible change and to help inform land management decisions that will help us to better cope with climate change. What does the latest scientific evidence tell us about the climate change impacts for forestry? In July an Agriculture & Forestry Climate Change Impacts Report Card was published by the Living with Environmental Change Partnership (LWEC). It is the latest summary of the scientific evidence of how climate change is affecting agriculture and forestry in the UK. It also explains how climate change might affect these land uses in the UK in the future. The Report Card is based on the findings from nine detailed peer-reviewed papers prepared by leading experts, including those in Forest Research (who also acted as the lead author for the forestry sector). • New and emerging pests and diseases as particular risks. • In the next 20-30 years timber yield potential is likely to increase in the cooler, wetter uplands and the north and west of the UK but in drier areas, on lighter soils or for species that are sensitive to drought, there will be reduced growth. • In the longer term reduced water availability and more frequent extreme weather events are likely to reduce both growth and yield potential in many areas. • Biodiversity in semi-natural and managed woodlands is expected to adjust as a result of a changing climate. • The range and quality of the other ecosystem services that forestry provides and relies on will also change. These include climate control, flood regulation, pollination and nutrient cycling. It highlights the importance of actively managing woodlands to help them cope with our changing climate, for example by improving forest structure, diversifying tree species, and increasing their ability to cope with greater weather variability and extreme events such as drought, wildfire and wind storms.